Meaning, I always presumed, oafish, low IQ, bestial, low-brow, crude, illiterate, ill-spoken, boring, cloddish, unmannered, unskilled, unteachable, a loser…. in a word, a dodo. So who were the Neanderthals anyway? Do (did) they fit the caricature? What do we know about them? Why did they become extinct? What does their existence mean to us – as a species? there are the majority of geologists who think that an asteroid or some other bolide is what done in the dinosaurs (see “Asteroid Smasteroid,” below), and then there are the other geologists who hold that, although an asteroid did indeed strike the Earth round about the time that the dinos met their demise, it was not the root cause – probably a contributor, but not the prime causation. In each, the debates can become polarized, then acrimonious, then intolerant, then back-stabbing and ultimately, exclusive of the other point of view and the other pointers of view. 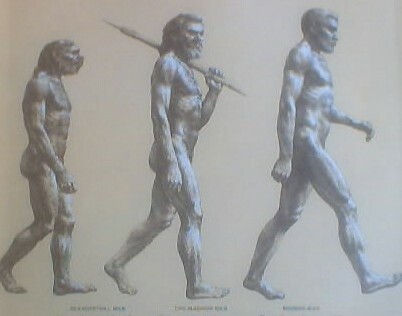 The Multi-Regionalist Camp – which holds that the different pre-modern populations of humans, the ones which had migrated out of Africa a long time ago and are very well-known in the fossil record in their respective regions of the globe, evolved independently into the many varieties of modern human populations – not species so this is not implausible. These populations have been referred to as ‘races’ (more on that nomenclature later). Multi-Regionalists allowed for interbreeding between existing pre-modern humans with anatomically modern humans (amh) as part of the evolution, but it is not an integral part of the theory. Rather gene flow among populations is the mechanism which kept us as one species. (Click on any image for a larger view). Neither is unequivocal but as in many other disciplines in which polarization has occurred, the arguments became VERY passionate in recent years. There is evidence for both. The AR/OOA theory has best been supported by genetic data – MR by palaeontological and phenotypical (body types and physical characteristics) observation. In fact, more palaeoanthropologists accepted AR than MR – it was becoming a consensus, but it could not claim victory because the palaeontologic evidence for MR was too strong to just ignore. 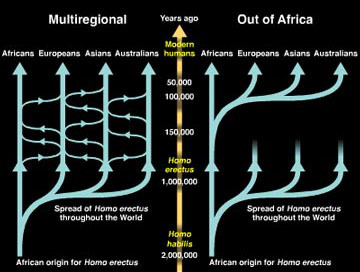 Note, however, that both concede that humans originated in Africa – the only difference is when modern humans left Africa and whether the earlier migrations out of Africa contribute to our current gene pool. Until recently, the genetics basis of AR was winning out – not only because of the weight of evidence, but because of a line of reasoning which was NOT scientific, but was dressed in scientific raiment to support AR. Over the course of the past couple decades, it became politically incorrect to espouse multiregionalism because it was equated with racism. Rather, it became THE politically correct stance to hold that all humans have exactly the same genetic background, that we are ALL of recent African descent, that all other, earlier homonid groups were inferior and were replaced by the recent African diaspora, that everyone alive today is a direct descendent of that recent exodus from Africa and that “races” are transient and meaningless and have no genetic basis. This is a noble position, and to a large degree true – but not completely. The adoption of that strong AR stance was a necessary imposition on scientists because of the idiotic position adopted by REAL racists after it was pretty well established that humans did indeed originate in Africa and not Asia. The racist position was that, if we all came from Africa originally, all non-African populations were MORE evolved, and, of course, better. With that kind of stupidity, it’s no wonder that most scientist became wary about making any statement about human evolution which could give racist morons even more grist for their misguided mills of misinterpretations and misinformation. It was a natural progression from the cautious avoidance of any hint which could be misconstrued that Africans somehow represent a more archaic form of humans to a position that all recent populations are the same because the migration from Africa was so recent. It even became taboo among scientists to recognize the genetic differences between modern human populations manifest in susceptibility to certain diseases. With the “discovery” of Mitochondrial Eve and Y-Chromosome Adam (unfortunate epithets, as those two lived about 60,000 years apart in time) the recent origins of all populations on Earth became comprehensible to the average person on the street and the campaign to expunge all non-amh populations from our line of direct descent and to mark all earlier varieties of humans as evolutionary dead-ends was on. Once more back to our Neanderthal buddies. From genetic evidence of the previous decade or so it appeared that Neanderthals and modern humans were different enough that the African Replacement model seemed the most plausible. Especially because their mitochondrial DNA was significantly different than ours. That seemed to close the door on Neanderthal lineages persisting to the present. (I have to let you in on my own view here – I was a heretic – a ‘modified’ MR theorist – it was my opinion that the genetic differences we see now resulted from interbreeding between amh’s coming out of Africa with the local, older populations, including Neanderthals – and yes, I did receive not a little derision from main-stream scientists. But I must admit that that recent genetic evidence was making me waiver a bit and I was on the verge of conceding that Neanderthals were, indeed, a dead end – one must go with the data, regardless of where it leads). This past week, it was announced at a conference on human evolution that a new genetic sequencing study of the Neanderthal genome and a comparison with a broad spectrum of modern humans reveals something stunning. It seems that non-African populations of modern humans have Neanderthal genes mixed in at a small but significant number of locations in their genomes. Sub-Saharan African populations do NOT have those Neanderthal genes. The amh’s who left Africa 60,000 + years ago and settled the world appear to have interbred with Neanderthals at least in some locations. 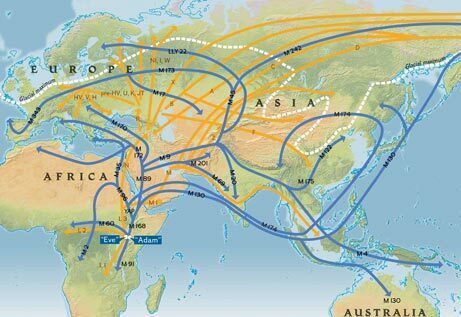 Those of the amhs who did not migrate out of Africa but remained at home during the most recent OOA diaspora obviously did not interbreed with previous migrants in the far flung corners of the world and so remain unchanged by any crossing. In other words, sub-Saharan Africans represent a more pure variety of what evolved in the homeland as amh. The populations of the rest of the world have genes of a more archaic human variety in their genomes. How’s that for irony for the white supremecist jerks of the world? We already knew that Neanderthal carried the gene for light skin and red hair – a gene which is absent in most modern human populations but is common in areas previously inhabited by our Neanderthal cousins. 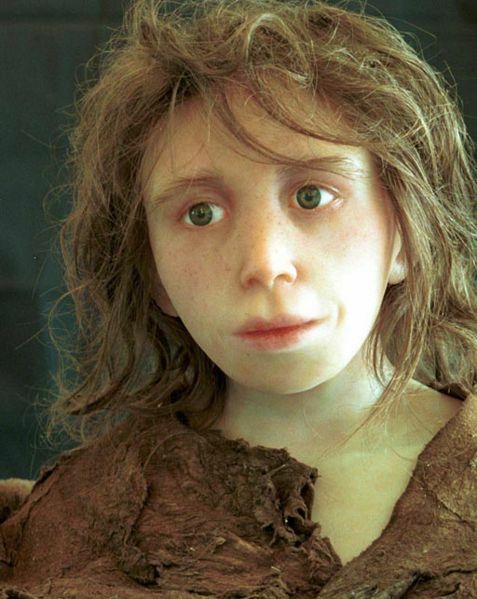 (The picture is an artist’s reconstruction of a Neanderthal child from Europe, based on skeletal and genetic data. You probably know someone who doesn’t look very different. Click for a larger view). This latest genetic finding shows that ‘white’ people are not a ‘more evolved race’ of humans than sub-Saharan Africans, but, rather, are a cross-breed of amh coming out of Africa with an earlier variety which had been around Europe and the Middle East for hundreds of thousands of years. 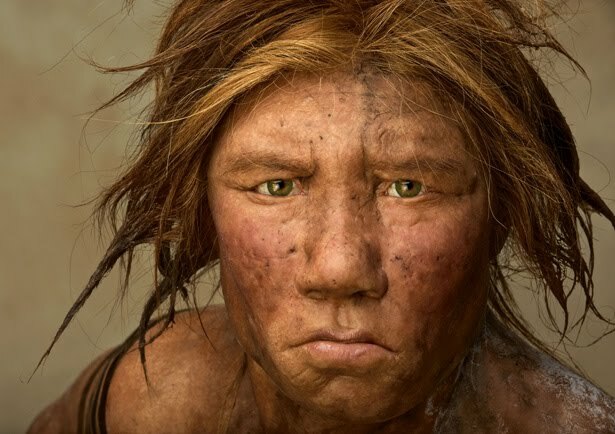 So what was different about the individual Neanderthal people? Not much. They were slightly larger than us, but no larger than the upper 25th percentile of modern humans. They had larger brains than us. They had a ‘weak’ chin. So do MANY modern humans – I know many people with a weak or absent chin. They had a prominent bone structure in their middle faces which resulted in a broad upper nose ridge (see picture) and a prominent brow ridge (so did Charles Darwin). Most of them had a small bony protuberance on the backs of their skulls called an occipital bun. Hell, I have one of those! Lastly, they had a receded forehead rather than the vertical one we have. All of these characteristics are “on average” so there is nothing odd about any trait. I personally know, and I think you do too, many, many people who have at least one of those characteristics. In fact I met a highly accomplished man, a professional violinist, who has ALL of them – a true modern day phenotype of Neanderthal. What this does is support the position that there is no such thing as any superior “race”. There really is no such thing at all as ‘race’ in humans as it had been understood previously. This new finding will make that conclusion even stronger. Local varieties of pre-amh populations interbred variously with amh coming OOA and with Neanderthals. The proof that there is no such thing as race is in the fact that every allele (variant form of a gene) is present at some frequency in EVERY population on Earth, with the exception of those genes which arose from interbreeding with pre-existing local populations – in which case those genes are absent in sub-Saharan African populations which stayed put during the diaspora. There is no unique genetic make up of any single “race”. But there are some genetic differences across and within all populations/varieties, and this latest finding explains those differences much better than either the OOA or MR theories could on their own. This is so logical and is one reason I was a ‘modified MR’ camper for so long. In order to remain a single species when our populations were spread around the world required gene flow. 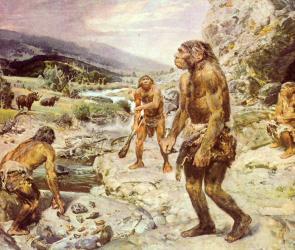 We now see that such gene flow included our recent cousin, the Neanderthals. This is how evolution works – the most vigorous rivals are those species or sub-species which compete for the same resources. It is often the case that one does not drive the other to extinction but that there is “back-crossing” of genes and assimilation of characteristics into into a single species. A complete genome sequencing of Neanderthals is due to be published soon, so there might be more to come on this one and an update will be posted here. 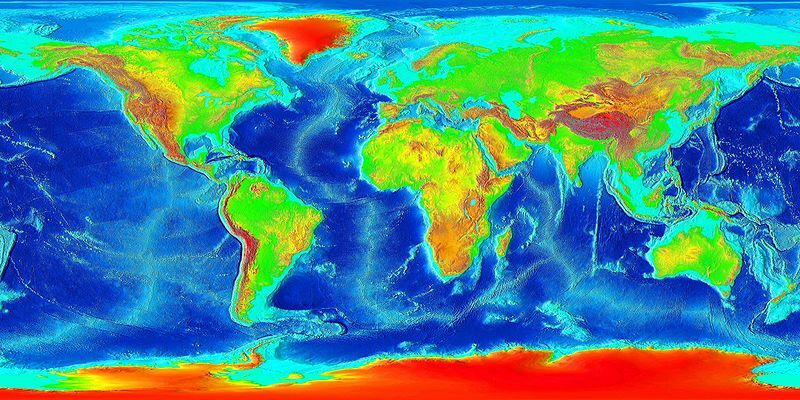 Celebrate Diversity – our single species is even more diverse than we thought previously. In the time since I wrote this post the Neanderthal DNA project has analyzed the data in greater detail and it is now very well established and accepted that in all populations of modern humans between 2% and 5% of nuclear DNA is comprised of Neanderthal genes – with the exception of Sub-Saharan Africans. Science triumphs – reason and tolerance benefit – racism takes one on the chin. Perhaps what is most interesting is that the former dichotomy – almost a schism – between the Recent OOA and MR theorists has become predictably less vehement. There doesn’t seem to be too much left over which to come to verbal blows – MR’ers have been vindicated that pre-existing forms in different regions of the world indeed contributed to the modern populations which ‘originated’ at the various places, AND OOA ‘ers can justifiable state that amh did, indeed, leave Africa only recently. Oh! And we can now answer that age-old question as to what it was that caused the Neanderthals to become extinct – THEY DIDN”T!!! The ARE us (Well, some of us). March 24, 2015 in General Earth Posts.